Follow the most remarkable episode in prehistory in this all-in-one compendium of everything dinosaur. This guide marries the very latest in paleontology with an easily accessible atlas format to illuminate the mysteries of dinosaur origins, clues to what they looked like and where they lived and, most intriguingly, what happened to them. 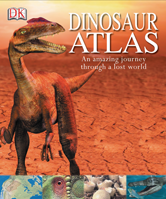 Using vivid recreations of the prehistoric world, DK's Dinosaur Atlas brings dinosaurs to life! It features the latest research and discoveries, shows where dinosaurs are on display, and lists important fossil sites around the world.